It’s rare for me to have a day when the time to cook aligns with the desire to cook and a need to cook, but it did for me recently. I had a full day with nothing, I mean nothing, on the schedule. I had been avoiding the kitchen since completing my cookbook manuscript, having burned out a bit in the mad rush to complete it, but as I watched snow flurries fall to the wet ground outside, I was inspired to cook again. Something warming. Something soothing. Something that would make people feel good. Perhaps I would take this to my friend who had just undergone another major surgery in her battle against cancer. 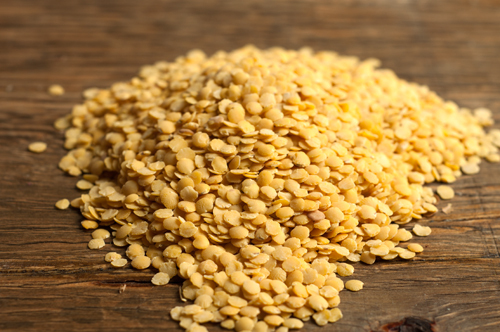 I was recently in Boulder so had the chance to shop at the huge bulk area of that Whole Foods store where they have so many varieties of everything, and I came home with these yellow lentils. Lentils cook up quickly, and can be combined with a wide variety of flavors to make them interesting. You can eat them whole or puree them into a soup as I decided to do. 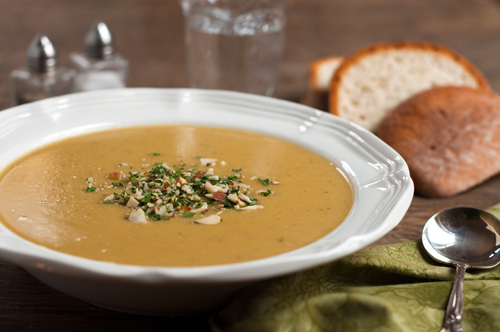 How many times on this blog have I posted about how easy homemade soups are? You start with some aromatic vegetables (celery and onion here), throw in your main ingredient (yellow lentils here), add stock (chicken or vegetable is fine), add seasonings of choice (a little cumin for me), simmer until cooked, and then decide if you want it as is, slightly chunky, or pureed. Season it with salt and pepper to taste. I made this one a bit special by adding a simple yet interesting garnish of almonds and parsley. This soup is just what the doctor ordered. Heat oil in a medium saucepan over medium high heat; add onion and celery and cook until slightly soft, about 5 minutes. Add lentils, stock, cumin, and a bit of salt and pepper; cover and simmer until lentils are soft. Puree with a stick blender or traditional blender, adding more stock as needed to achieve the desired consistency of your soup. Adjust salt and pepper. To serve, ladle into bowls. 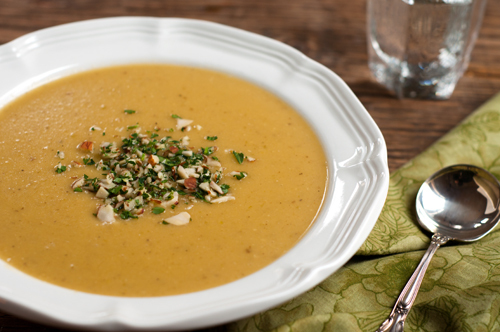 Combine minced parsley and almonds and top each bowl with a bit of the garnish. I’ve been on a soup kick lately and it’s included brown and red lentils and green split pea but now I see another lentil I wasn’t aware of? I love your garnish; not just because of the punch it provides for the soup but know only too well how a bit of somethin somethin on top of a bowl of soup can make all the difference in how it looks to a reader. And this looks delish. What a wonderful looking soup. You can never go wrong with lentils, never. I love the garnish.